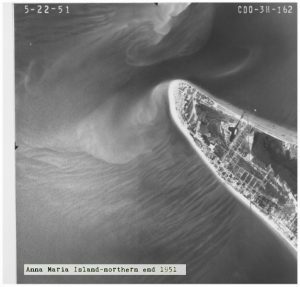 A collection of aerial photographs of Manatee, Sarasota, and Charlotte counties is housed in the USDA Natural Resources Conservation Service (NRCS) Manasota Service Center. These aerials are used extensively in agriculture, conservation, urbanization, hydrology, land use and history. Prior to their placement online at the University of Florida Maps & Imagery Library, we had quite a few visitors to the USDA Manasota Service Center to view the collection. We still welcome you to view, photograph, scan, or copy areas of interest from these photographs. Please call first (941-907-0011) to arrange an appointment, so that we may assist you. Visitors often want to view the same property or land over time to be able to document the changes that have occurred through the years. 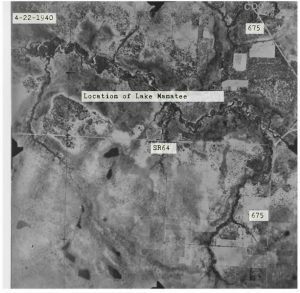 Here are two aerial photographs showing the location of Lake Manatee, the 50th anniversary of the dam construction was celebrated in 2015. 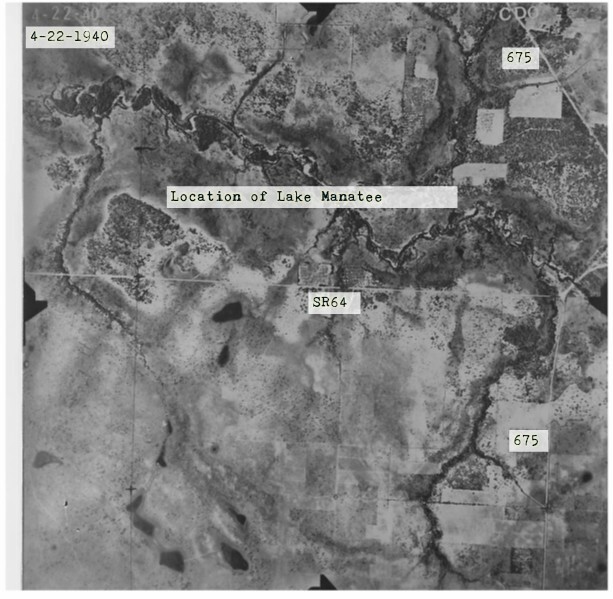 In 1940, Lake Manatee was not present (left) and in the 1994 flight it is clearly visible (right). 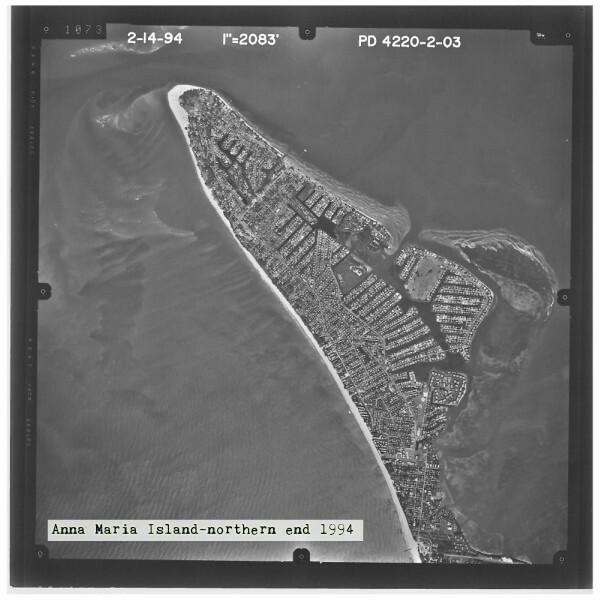 Here are aerial photographs of the northern end of Anna Maria Island in 1951 (left) and 1994 (right). Locally led conservation in Manatee County is assisted by the Manatee River Soil and Water Conservation District http://www.manateeriverswcd.com/ in partnership with the NRCS. In the banner photo at the top of this blog are the notes kept on the back of a 1940 aerial about the properties of the listed farm owners for the purpose of conservation planning and technical assistance. 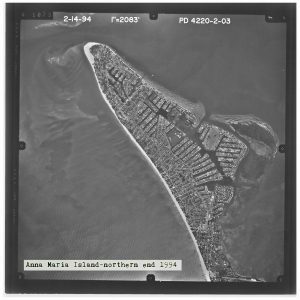 The largest and most complete collection of Florida aerial photographs outside of the National Archives is housed at The University of Florida Map & Imagery Library. 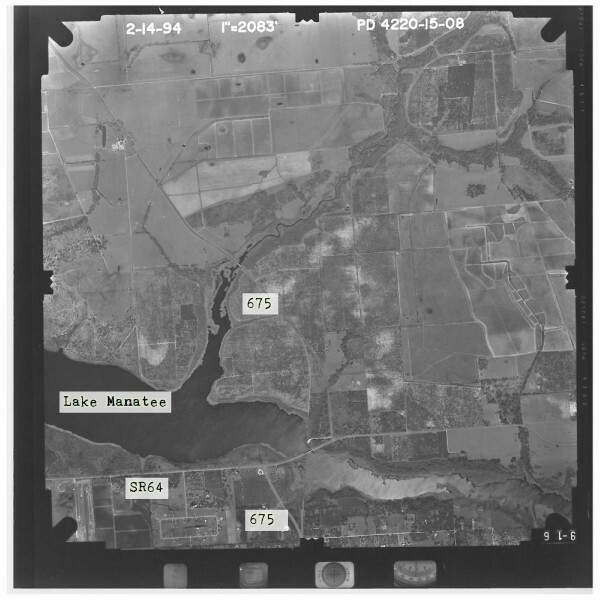 These photos document the changes in Florida’s land use between 1937 and 1990. The USDA aerials were originally intended to assist farmers in accurately assessing their farms and to provide information on crop determination and soil conservation, today these images provide some of the oldest land use/cover information available. With a Google Maps based search on the site, one can search by address, point, or area. One can also see the flights by county, by year, flight number and aerial number. In this case, it helps to have the aerial number to locate what you are seeking. 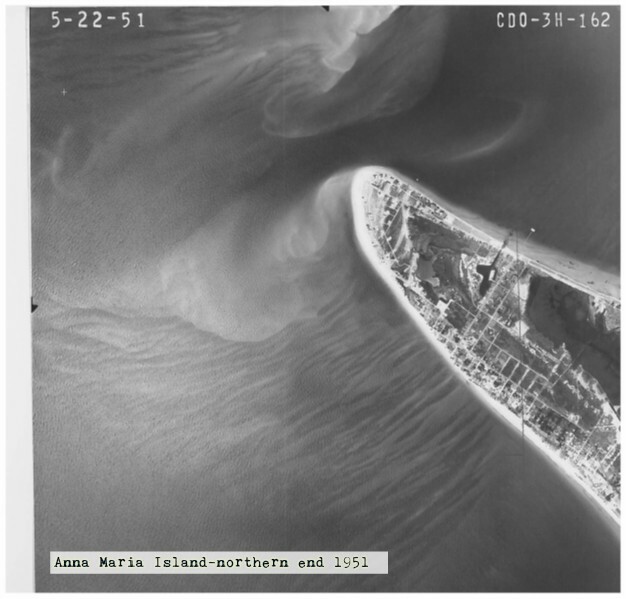 In the online collection, flights between 1940 and 1994 are available for Manatee County, between 1948 and 1993 for Sarasota County, and from 1946-1975 for Charlotte County, with similar ranges available in the USDA NRCS Manasota Service Center. The Charlotte County maps are a more recent addition to the office, and the collection is incomplete. Most of the Charlotte County maps we have are from 1951 and 1952.